Home Uncategorized How many damn horsemen are there in this apocalypse, anyway? 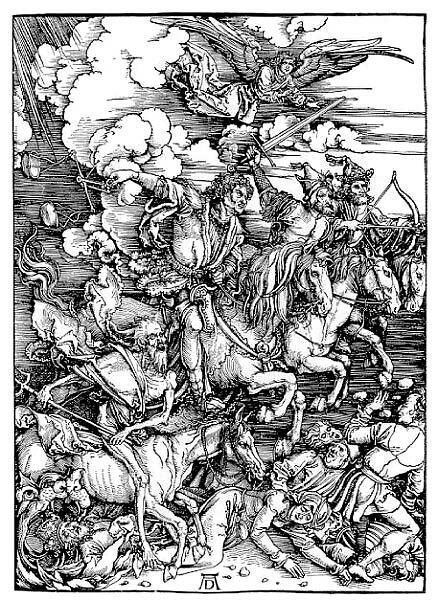 How many damn horsemen are there in this apocalypse, anyway? Quico says: Here’s a crushingly obvious but seldom made observation about chavismo’s decision to shut down RCTV: the claim that the move is about the station’s coupsterism in April 2002 rather than about its current editorial line is patently – almost self-parodically – bogus. It’s that even this white flag is patently false, if you stop to think it through for a second. Because RCTV was hardly the only mass market TV network that aggressively took sides in April 2002. Venevisión and Televen took pretty much the same line back then. As did Globovisión. The four colluded in the April 13th news blackout. The private TV stations had collective ownership of the coup. Remember that stuff about the four horsemen of the apocalypse? Slowly, imperceptibly, they dwindled down to just one, all the easier to isolate and pick off. Now, Globovisión can be safely ignored since only a bunch of middle-class obsessives watch it. And the other two? Well, Televen has drastically toned down its criticism of the government, while Venevisión more or less openly parrots the government line these days. Their newfound loyalty cleanses the sins of April 2002, while RCTV’s pigheaded editorial independence deepens its share of blame. Out of the channels normal people watch, only RCTV couldn’t be cowed. But chavismo is no longer willing to allow dissident messages on mass-market media – so RCTV had to be silenced. More and more, our media landscape looks like Russia’s, with the mass market tightly – if indirectly – controlled and dissent ghettoized into a outlets only a small, politically marginal demographic consumes.